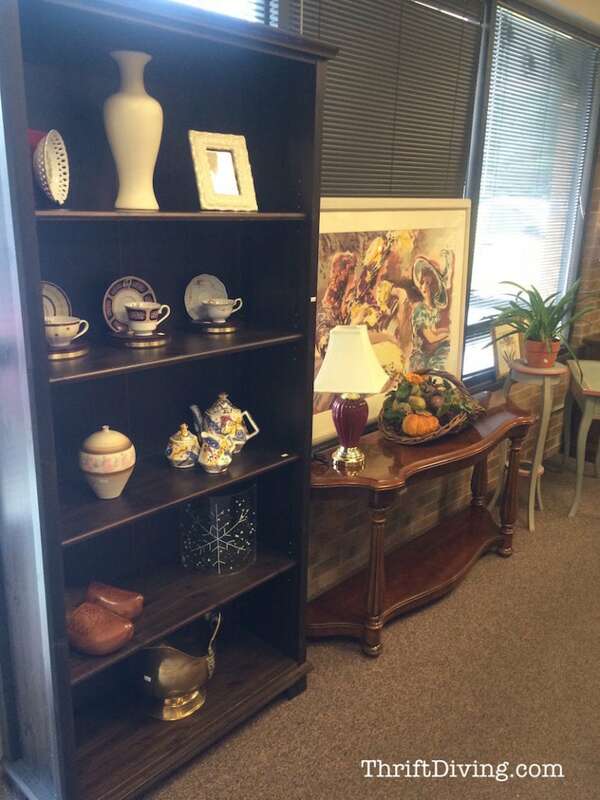 If there’s one thing we love, it’s cheap prices at thrift stores. I’m lucky that I’ve got the best thrift stores here in Maryland. But this week I stumbled upon an upscale thrift store that made me stop in my tracks. (See the other amazing stuff I found at the thrift store this week, too). 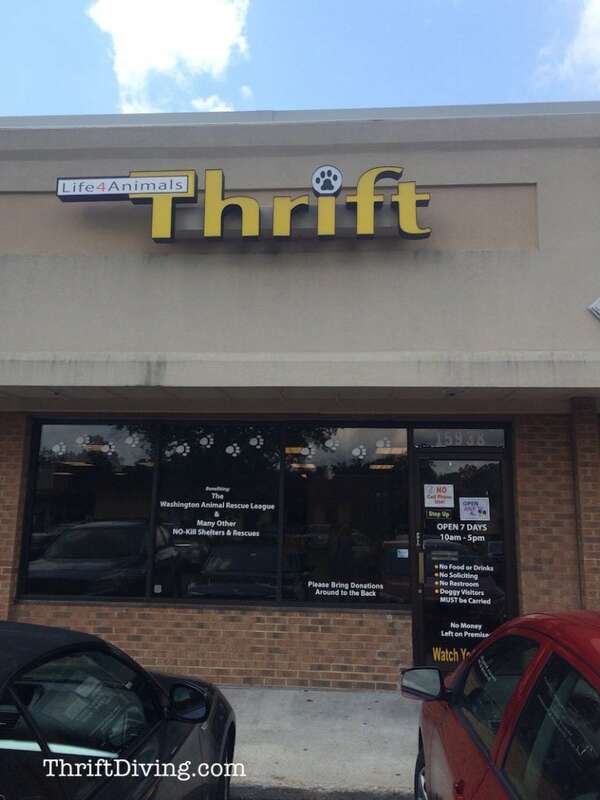 I’d never heard of this store, Life4Animals Thrift, in Gaithersburg, Maryland. This was a new neighborhood about 30 minutes away (I live in Silver Spring). I was about to get into my van when I saw it. I had to stop!! 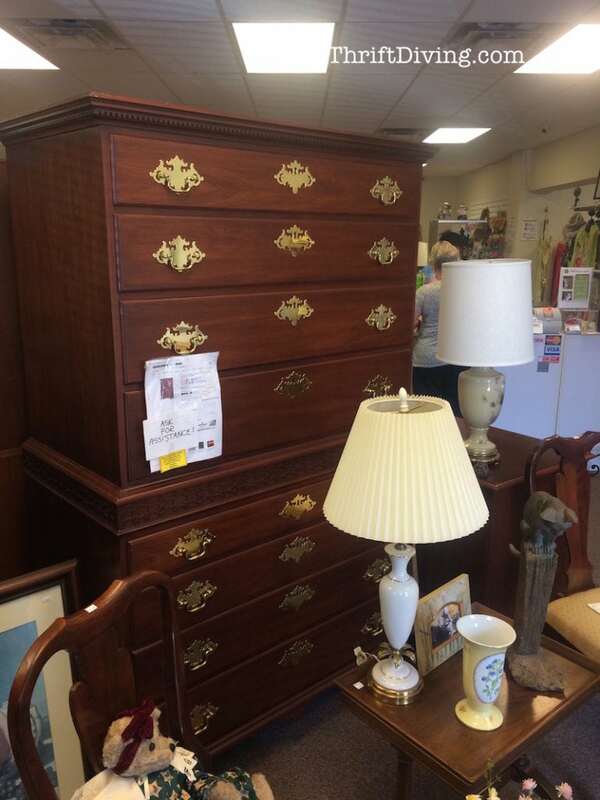 Apparently dressers like this go for $13,000 (so said the employee), but still, there was no way I was paying that amount for a dresser. From a thrift store, at that. 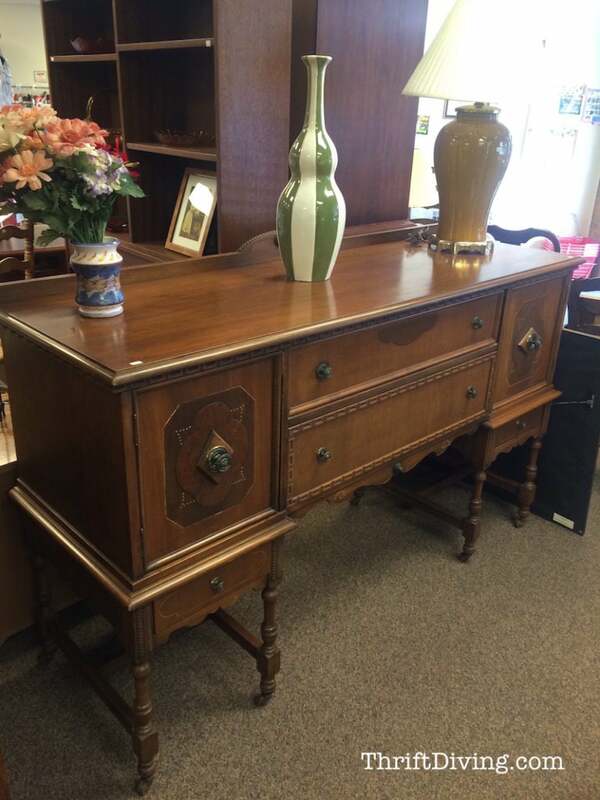 I kept walking and saw this vintage buffet. It was pristine. I noticed the price was $250. 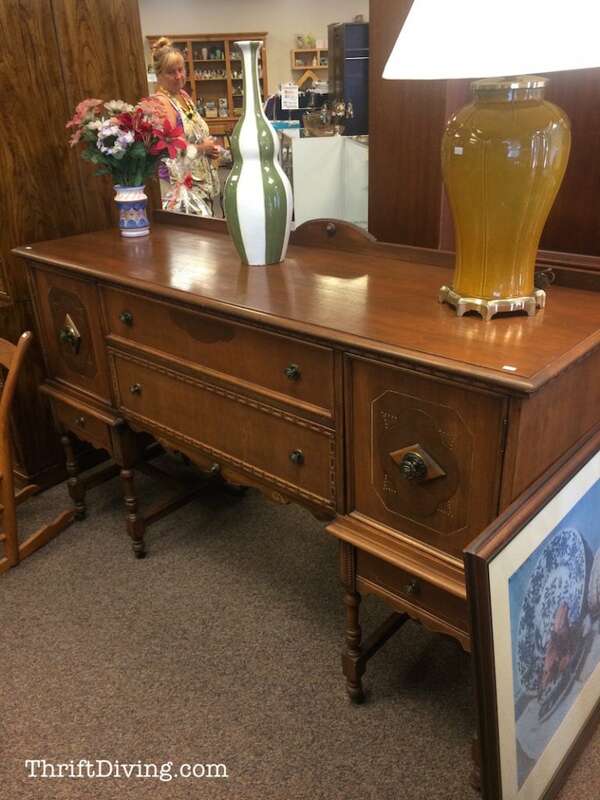 Which made me wonder, “Would I pay $250 for a buffet?” I’m so used to finding buffets (like this vintage buffet I made over) for $50 or less, it was hard to imagine paying that amount. Would YOU pay $250 for this buffet?? Yesterday I thought I wouldn’t. 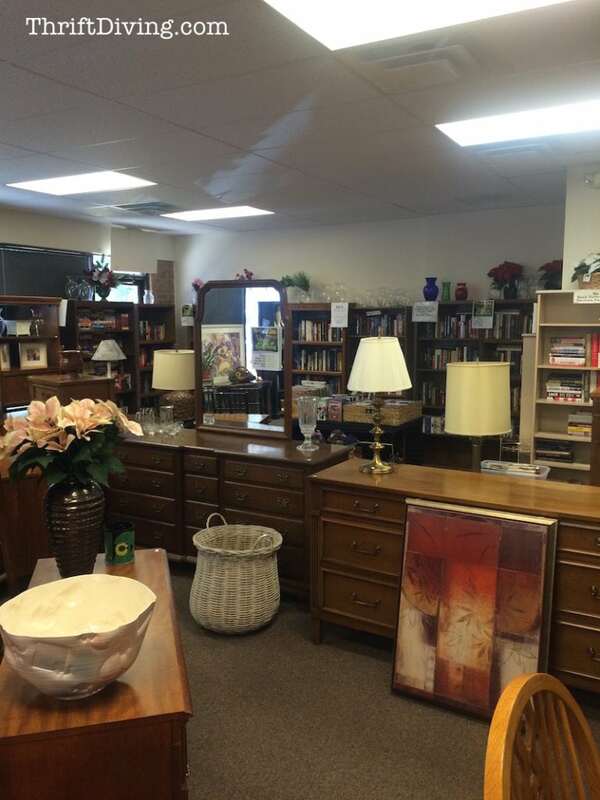 But the more I thought about it, and how clean this thrift store was (excuse me, upscale thrift store, as they call themselves online), I think I would. Talk about organized! This was so unlike my usual Value Village thrift store (located on New Hampshire and Powder Mill in the Hillandale shopping center, for all you locals). It was the difference between going to Walmart versus going to Walgreens, if that makes sense. Things here weren’t all scattered and misplaced. It looked like someone took thought to carefully place and arrange items, as if they were valuable and loved. Even the kid’s section was cutely organized. My 3 sons could hang out in this spot while Mommy shops, and it felt more like a play area at a cool bookshop. I really liked that! You know that familiar thrifted odor, right? The kind that hits you in the face as soon as the door opens and makes you hold your breath? But then you realize you’d rather shop than faint, so you just adjust. HA! When I leave my favorite thrift store, I want to douse my hands in disinfectant (don’t say you don’t want to do the same). But this place….smelled normal. It was welcoming. It was cleaner. Less icky. And because of that, I think I’d be willing to spend more money if the “ICK” factor isn’t there. 3. They weren’t ripping people off. 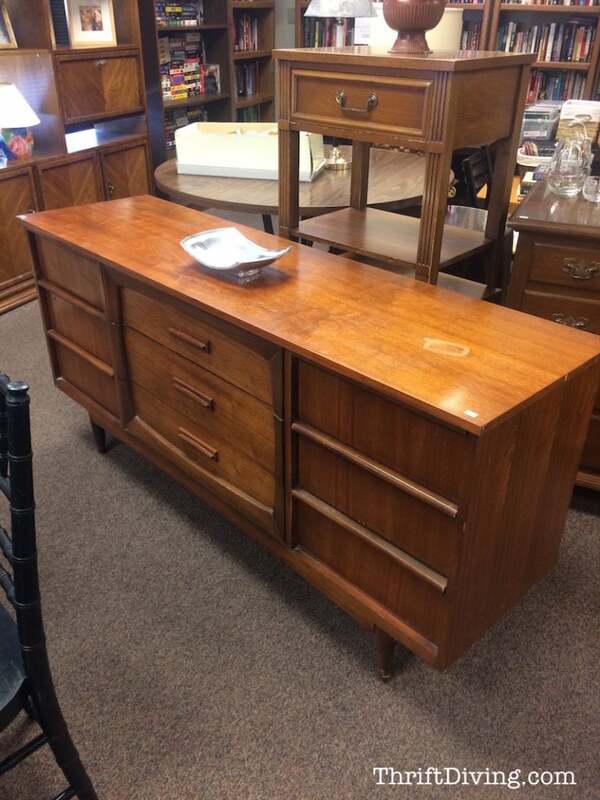 They had this amazing mid-century modern buffet for $150. Again, although more expensive than what I usually buy, it was still a solid piece. 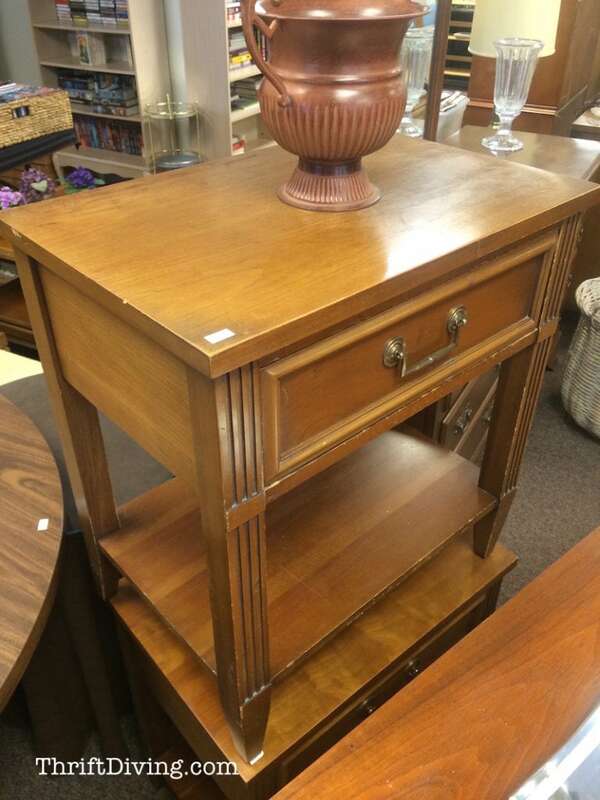 They had these end tables for $40 for the pair, which I thought was reasonable, too. I’ve paid $30 for one end table at Value Village, where I get all my deals. So $20 for one here was reasonable, I thought. 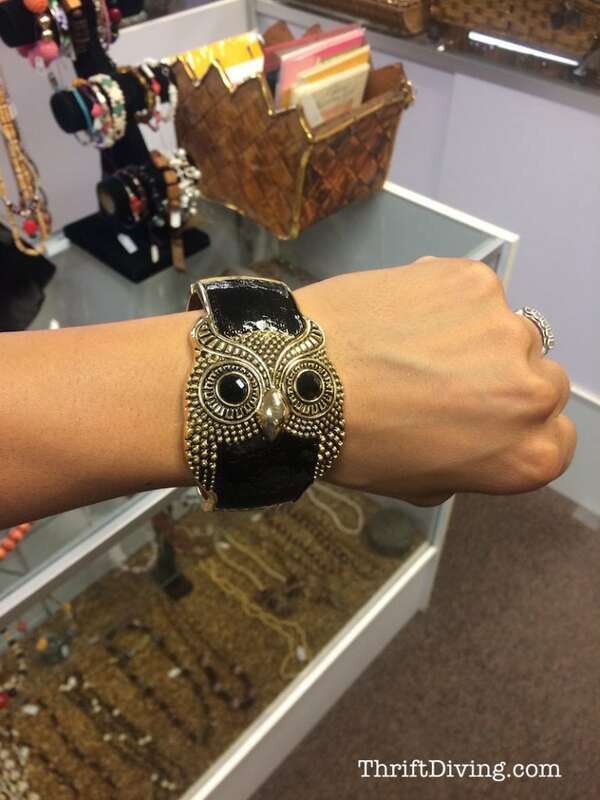 And the fact that I walked out of there with the cutest OWL BRACELET for only $3.00 (love it!! 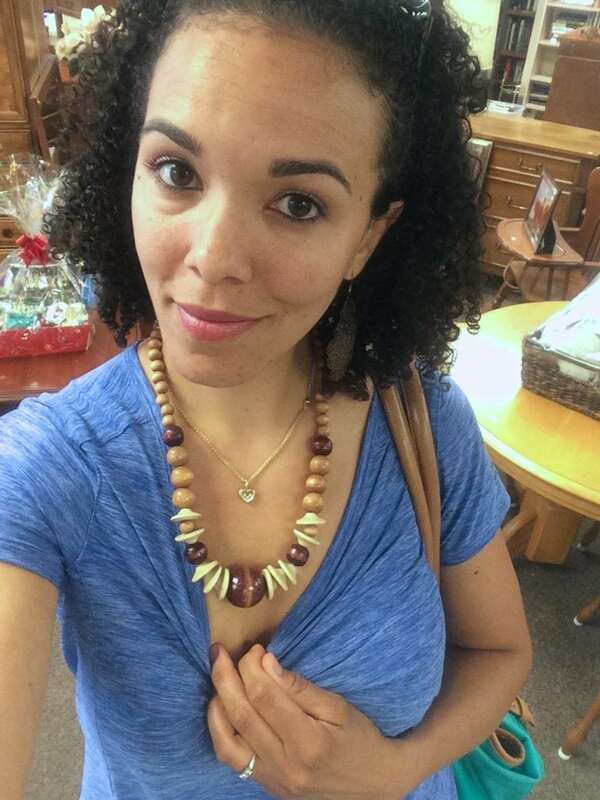 ), and a wooden necklace for $3.00, it was a happy shopping experience! I liked that I could find treasures at cheaper price points without feeling like everything was jacked up. There was something there for everyone. 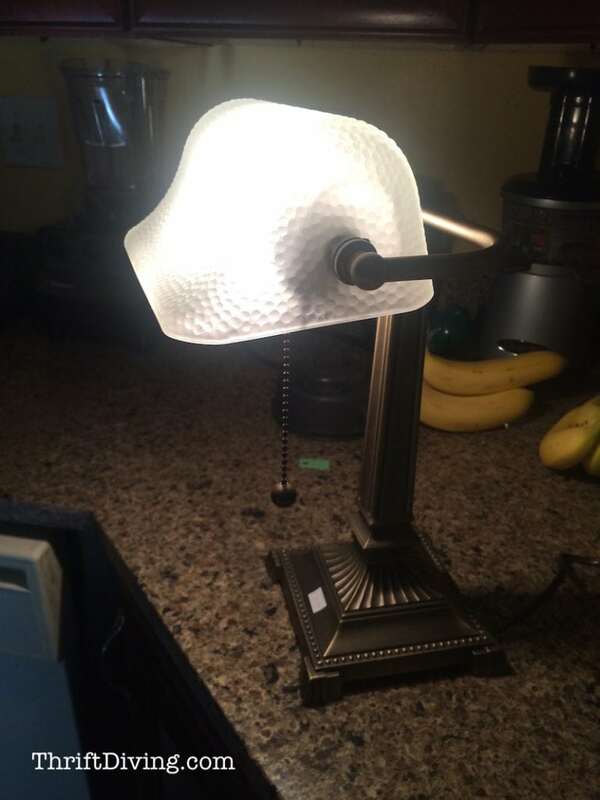 I also picked up this desk lamp for $10. It was solid!!! 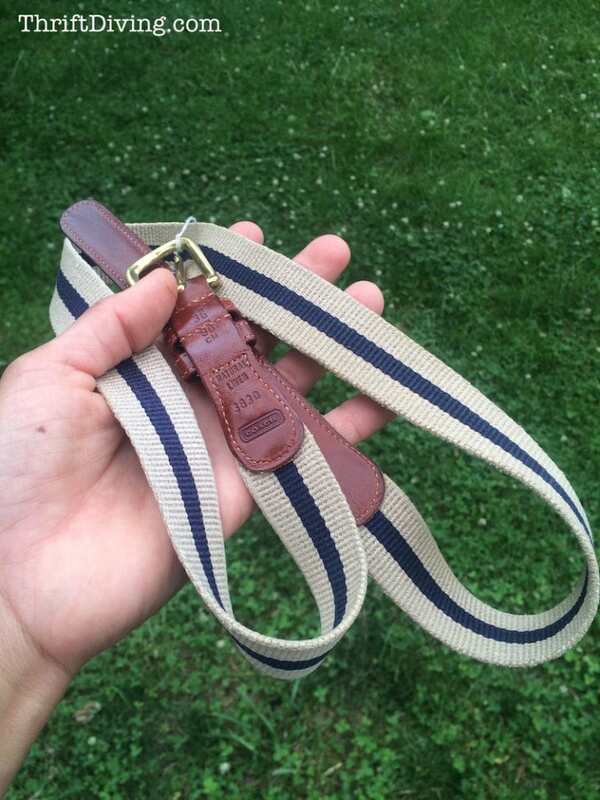 And this Coach belt I got for $3.00, too! 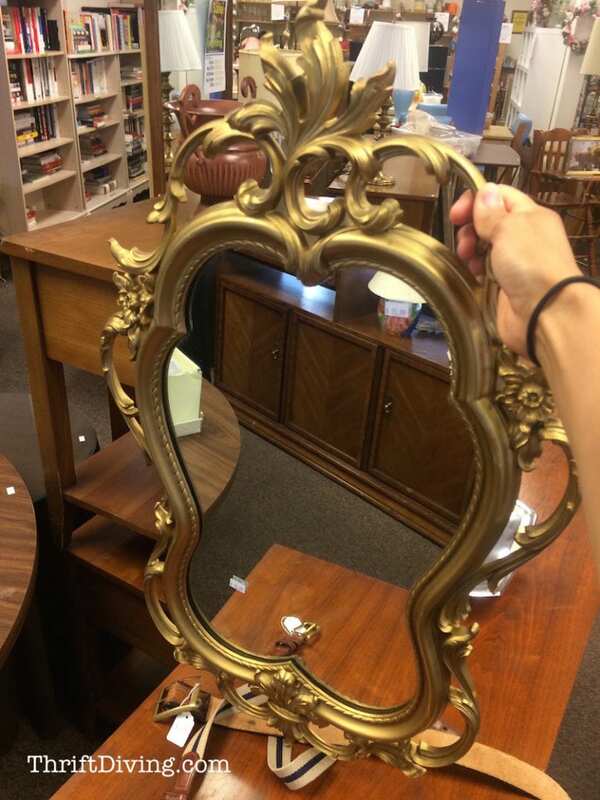 And I got this mirror for $12! I’m going to spray paint it pink (maybe) and put it in my master bedroom, which I made over recently. 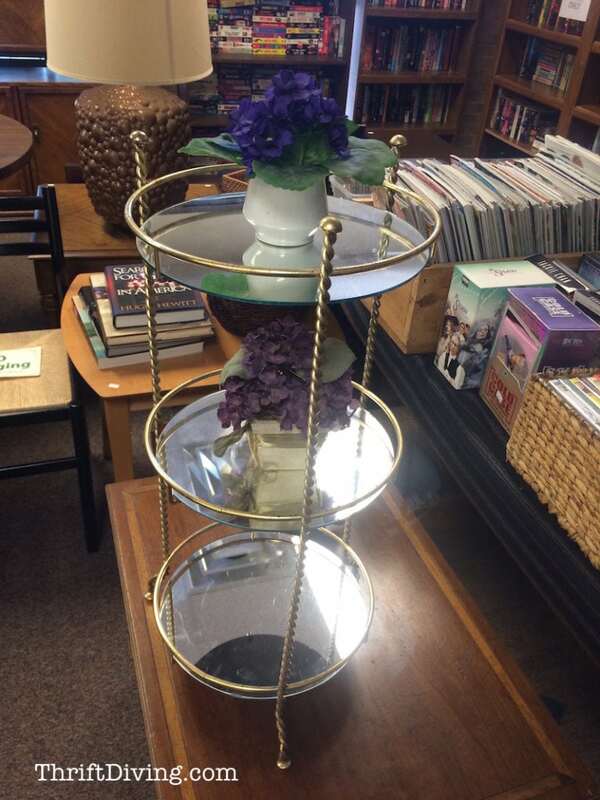 And I also picked up with metal little table with glass inserts, for $8! 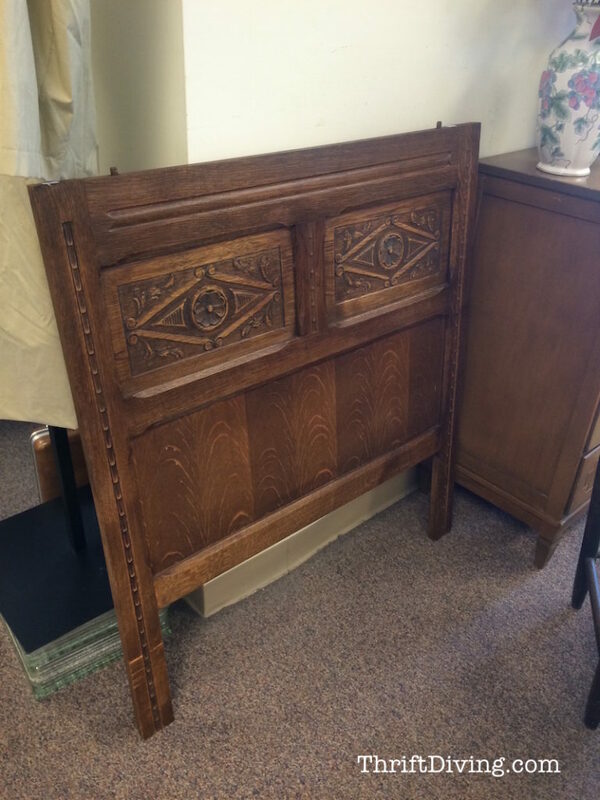 Even though I didn’t get this headboard, the fact that it was $8.00 impressed me. I felt like it should have cost so much more. It would have been a fabulous bench! I also didn’t get any of these pieces of furniture. They were about $100 each. 4. It came highly recommended. I love talking to other thrift divers. You get the whole story about a thrift store. 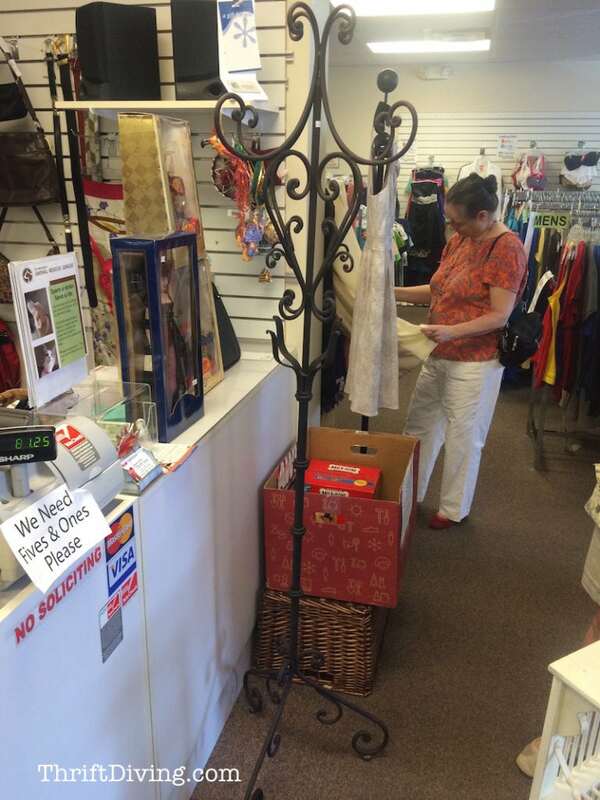 One of the customers had found this ah-mazing coat rack for $40. She said she’d been shopping at this store for years, and that they had the best stuff. She was also a DIY-lover of painting furniture and making things over. You have to listen to the regulars. If they say it’s a great spot, then you’ve found a goldmine. We’ve got to support the good shops! 5. I’ve paid $250 for Ikea….so why not vintage?? I’ve probably paid more for my Ikea bedroom furniture that we’re still rockin’ after 12 years (it’s nailed together, though…just sayin’…). So why wouldn’t I pay $250 for a buffet that would probably last long enough to pass down to my children’s children’s children? It’s okay to pay for quality. (Now…I have to say, if you’re buying $250 furniture to resell, you won’t make much profit. But for yourself?? Go for it! 6. It supports a good cause. Let’s not forget the whole point of thrift stores: to do good for communities and causes. So imagine if we spend $250 on a buffet. So what?? We’re helping a nonprofit (in this case, the Washington Animal Rescue League). Although, did you see the big stink going on about Savers and how they have been sued $1.8 million because they weren’t honest about the amount of their revenue goes to the non-profits they’re supposed to be supporting? Yep, read that article here. But for the most post, I think thrift stores are genuine, and our money goes to good causes. 7. We waste money on other things. I could easily buy a blogging conference ticket for $250, which is a one or two day event, and then it’s over. Hopefully I would gain something from it that lasts a lifetime, but you know what I mean. If you can pay $250 for this or that, why not for quality furniture that will last a lifetime? 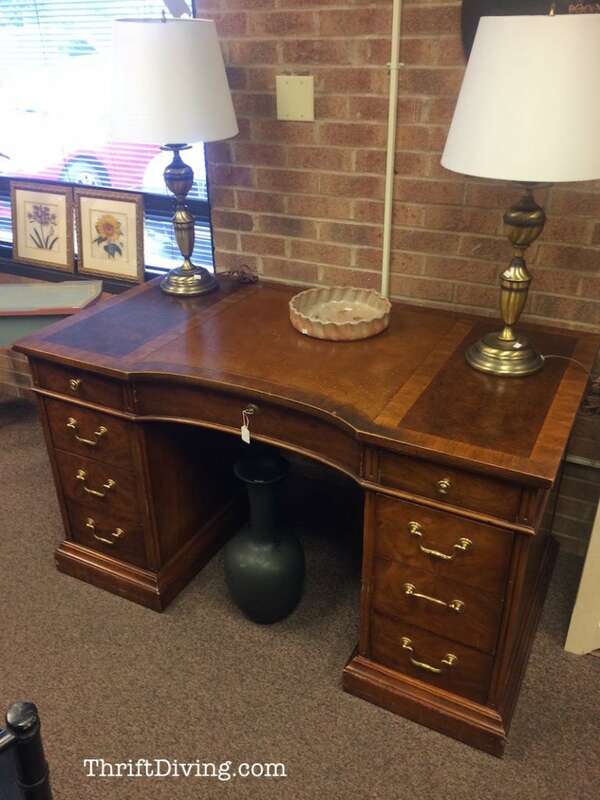 Especially if it’s an in-demand piece like this buffet. It’s all a matter of what we value. And while you don’t have to spend tons to get good furniture, when you do come across good furniture at a thrift store, don’t be afraid to pay a little more for it. In the end, you get your money’s worth! Would you have bought any of these pieces of furniture for these prices? 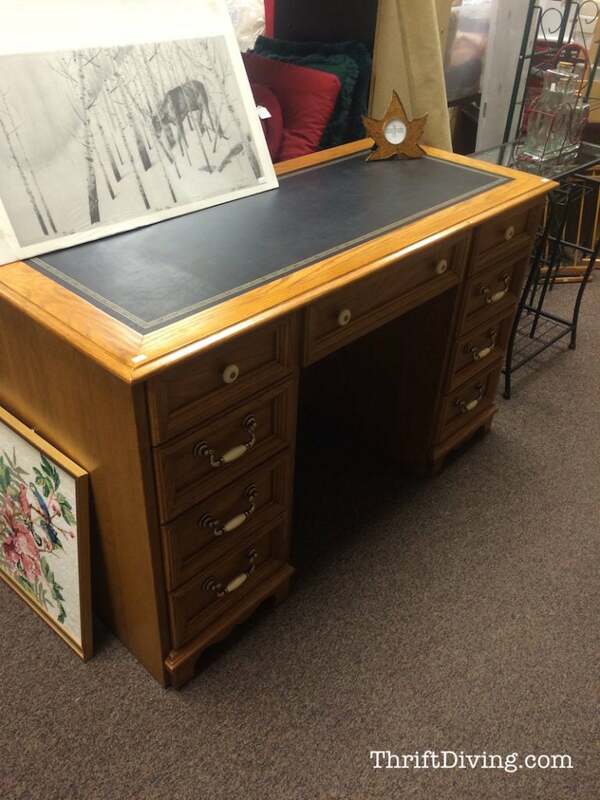 Have you ever turned down thrifted furniture because you thought it was too expensive? Leave a comment below and add to the conversation! Just to include another couple of angles I’d like to comment from the viewpoint of a thrift store volunteer assistant. Items are priced according to condition, original retail price and ‘popularity/desirability’, i.e. some things sell much more readily than others. The end price should be the price that raises the maximum amount of money for the charity while still ensuring the customer ends up with a bargain and comes back for more! I also look from the point of view of the donor. In Australia there is no tax advantage to donating used goods to a thrift store, it is a purely altruistic act. If I had donated an expensive item of furniture to a thrift store, e.g. the $13,000 chest of drawers, I would be very annoyed to see it offered for sale for $500. a fraction of its value and a fraction of the amount the charity could have raised from its sale. I would certainly agree with most of your respondents that if I was buying for myself and really wanted the item I would have no qualms about paying what I consider a fair price like $250 for that sideboard. Thanks so much for describing and photographing this store! I have a bunch of high end stuff I want to donate (didn’t sell on ebay, argh) to a charity shop, but I wanted the charity to get as much money as they could without ripping people off – I didn’t want them to just give my stuff away like plastic bags. Plus, that way I also know the buyers really appreciate the items, too. Animal causes are close to my heart, so now I’ve got a perfect place to donate! OMG, Sadie! I had no idea! This is such good information to know. I shared it on my FB page! You don’t think about these sort of benefits, but I’m glad to read this. 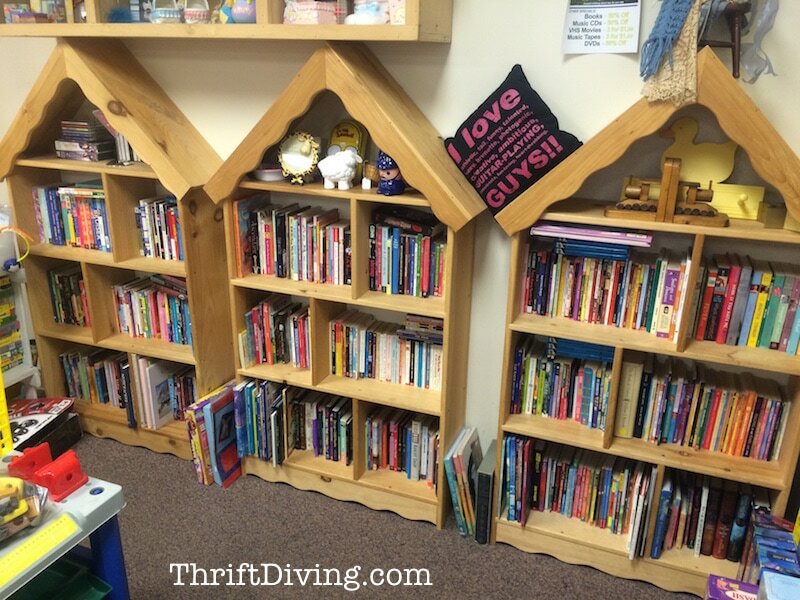 It makes what us thrift divers do so much more important! 🙂 Thanks for sharing that!! I’ll keep spreading the word! 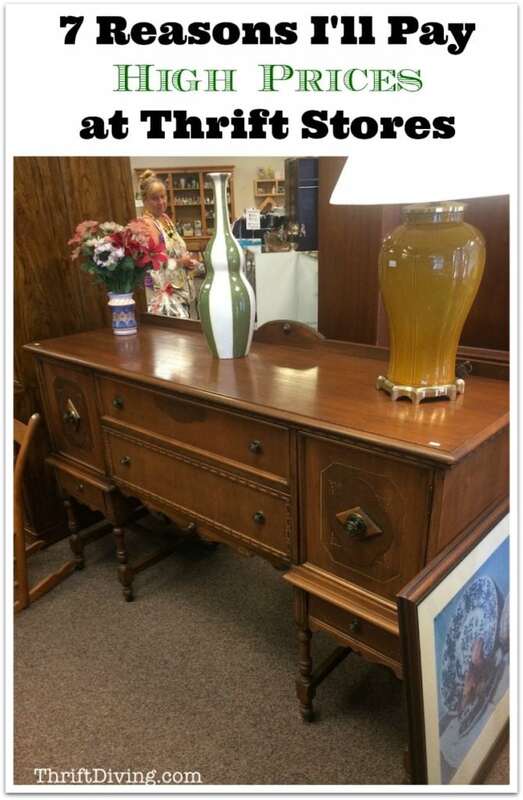 I would pay $250 for that vintage buffet and I’d also pay $150 for that mid-century buffet (LOVED IT) if I was in the market for either, which I’m not – I have been though and at the time I would have grabbed either of them. I would make over the mid-century one and leave the vintage intact. 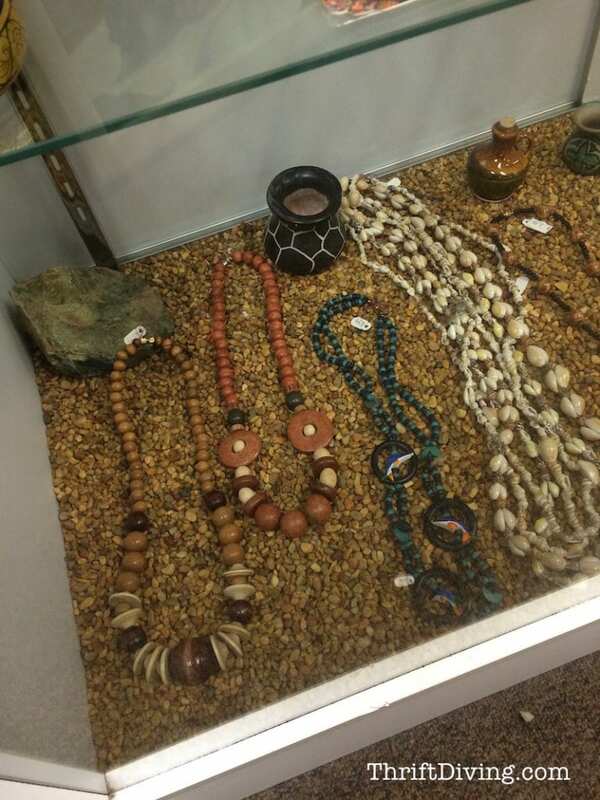 I haven’t found a nice (upscale) thrift store like that here, but we do have antique “malls” with booths run by different vendors and occasionally there will be a good deal at one of those. But with a house full of furniture including a few inherited true antiques – I’m just not in the market these days. 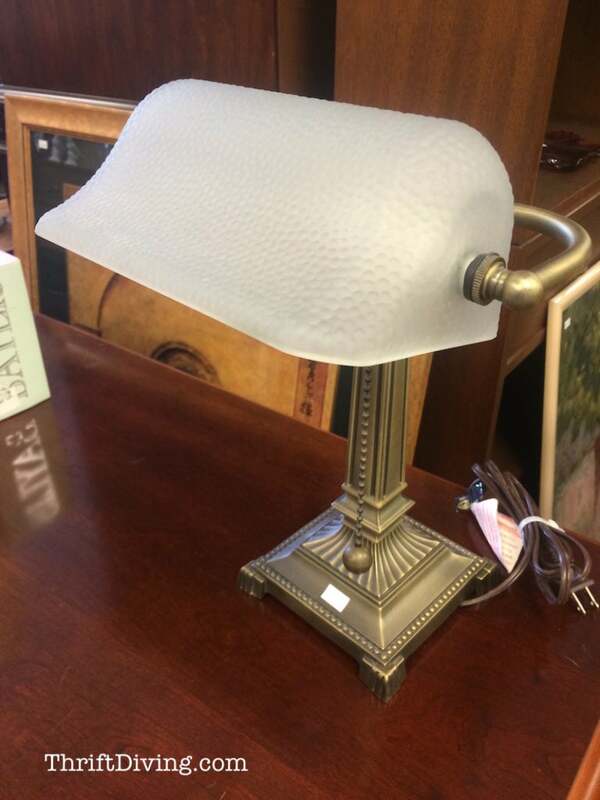 You did get some awesome deals – love the round table, and I would have gotten the $10 lamp. Since you’re from MD, Serena, I am surprised you didn’t expect higher prices at a Gaithersburg store. Even McDonald’s has different prices for different parts of a town, city or state for their food. When I am looking for a piece of furniture for my home and find it I will pay any reasonable price. I would find it hard to pass on the buffet but I don’t need one. 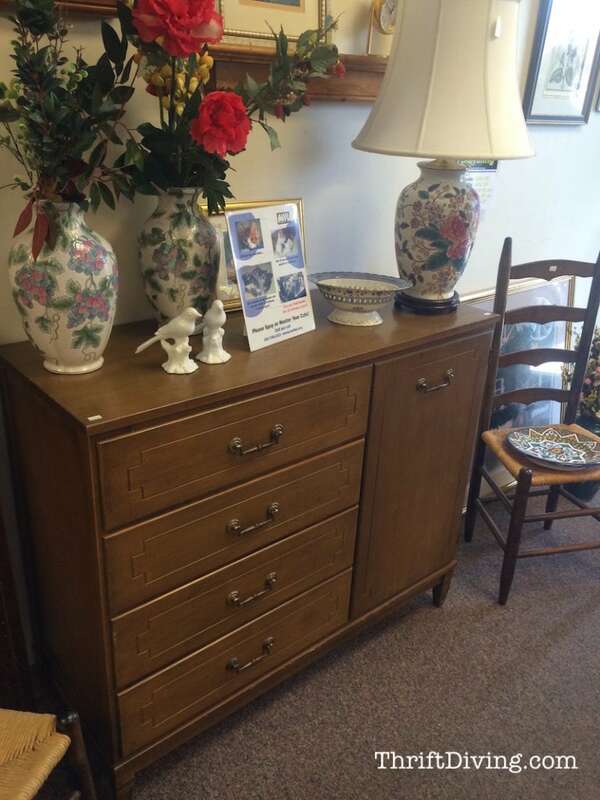 As for the dresser I know they can go high especially if antique. For some reason I thought you lived in Baltimore county. You’re closer to me than I thought. I’m in Emmitsburg. Hey, Linda! I know….what was I thinking?? Of course they’re more expensive there! LOL. Just last week I went to Safeway near my house, and 4 miles away with to a Shop Rite and even the avocados were expensive there since it is a less expensive part of town. I couldn’t believe I had been paying $1.00 – $2.50 each for avocados and the other store had them for $0.88! lol Just goes to show you….different neighborhoods do command different pricing. Oh, I also meant to comment, Emmitsburg sounds SO familiar. I’ve never been there. I’m in Silver Spring, Montgomery County, although I’m from Hagerstown and go there about once a month! I think you’re a little over an hour from me. So close! Only 40 minutes from Hagerstown! It would depend on the item, why I needed/wanted it and how/whether it would fit in my home, but yeah, I’d probably spend that much on something I really loved. So much of the stuff made these days is cheap and doesn’t last. A good piece of vintage furniture is so much better, and yes, I love looking at the cost per year to own something. That’s what they say about buying quality clothing, too! That’s a great way to look at it, Teckla! When you break it down cost per year, sometimes it’s worth it to pay more if you know you’ll keep it for a long time!